A gene is a stretch of DNA or RNA that determines a certain trait. Genes mutate and can take two or more alternative forms; an allele is one of these forms of a gene. For example, the gene for eye color has several variations (alleles) such as an allele for blue eye color or an allele for brown eyes. An allele is found at a fixed spot on a chromosome. Chromosomes occur in pairs so organisms have two alleles for each gene — one allele in each chromosome in the pair. Since each chromosome in the pair comes from a different parent, organisms inherit one allele from each parent for each gene. The two alleles inherited from parents may be same (homozygous) or different (heterozygotes). A specific variation of a gene. A section of DNA that controls a certain trait. A gene is a stretch of DNA that codes for a polypeptide via an RNA chain. These coded chains lead to “traits” in an individual, such as eye color and blood type. A gene is the basic unit of heredity. An allele is a variation of a gene. Genes come in many different forms, or alleles, that lead to the encoding of different RNA chains and, therefore, different traits. Genotype is the actual set of alleles carried by the organism. This includes alleles that are not "expressed." i.e., alleles that do not end up influencing the specific trait that they code for. On the other hand, the phenotype is the expression of the genes. i.e., the specific traits that are observed as a result of the genetic makeup of the organism. For more information, see Genotype vs Phenotype. Each organism has two alleles for every gene, one on each chromosome. If the two alleles are the same (e.g., both coding for blue eyes), they are called homozygotes. If they are different (e.g., one for blue eyes and one for brown eyes), they are heterozygotes. In the case of heterozygotes, the individual may "express" either one or a combination of the two traits. Alleles may be dominant or recessive. A dominant allele is one that will always be expressed if present. For example, the allele for Huntington’s disease is dominant, so if an individual inherits an allele for Huntington’s from only one of the parents, they will have the disease. On the other hand, a recessive allele is one that will only be expressed if it is found on both genes. Gregor Mendel did extensive work with plants to identify patterns in the phenotypes (expressed traits) and determine which alleles were dominant and recessive. Studying alleles can help predict traits in offspring based on the genes of parents. For example, if the allele for brown eye color (upper case B) is dominant and the allele for blue eye color (lower case b) is recessive, the various combinations of genotype and phenotype can be determined using a Punnett square diagram. Brown and blue eye color alleles in parents indicate a 75% chance that the offspring will have brown eyes. Both parents in this example have heterozygotic alleles — for brown (dominant) and blue (recessive) eye color. Either of these alleles may be inherited by the offspring from each parent. The Punnett square diagram shows all combinations of alleles that are inherited, and marks the resulting phenotype for eye color. Given that brown eye color is the dominant allele, and that 3 out of 4 possibilities result in at least one brown eye color allele being inherited, the probability that the offspring will have brown eyes is 75%. 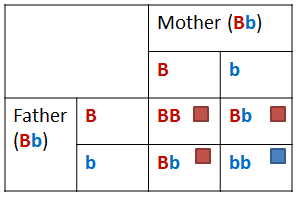 A Punnett square diagram predicts an outcome of a particular cross or breeding experiment. In this example of peas, one parent has the recessive yy set of alleles and another parent has Yy (heterozygote) set of alleles. The diagram plots the 4 possible combinations of inherited alleles in the offspring, and predicts the resulting phenotype in each case. The color yellow is determined by the dominant allele Y and the color green is determined by a recessive allele. Thus the probability of the resulting peas having a phenotype of yellow color is 50% and that of green color is 50%. 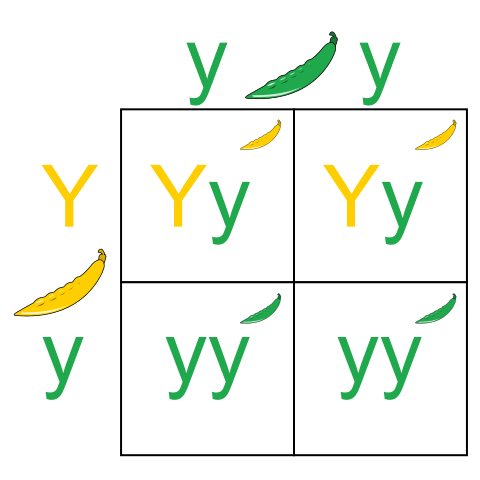 A Punnett square for the color of peas. Another example is blood types in humans. At the gene locus three alleles—IA, IB, and IO—determine compatibility of blood transfusions. An individual has one of the six possible genotypes (AA, AO, BB, BO, AB, and OO) that produce one of four possible phenotypes: "A" (produced by AA homozygous and AO heterozygous genotypes), "B" (produced by BB homozygous and BO heterozygous genotypes), "AB" heterozygotes, and "O" homozygotes. It is now known that each of the A, B, and O alleles is actually a class of multiple alleles with different DNA sequences that produce proteins with identical properties: more than 70 alleles are known at the ABO locus. An individual with "Type A" blood may be an AO heterozygote, an AA homozygote, or an A'A heterozygote with two different 'A' alleles. "Wild" alleles are used to describe phenotypic characters seen in 'wild' population of subjects like fruit flies. While wild alleles are considered dominant and normal, "mutant" alleles are recessive and harmful. Wild alleles are believed to be homozygous at most gene loci. Mutant alleles are homozygous in a small fraction of gene loci and are considered infected with a genetic disease and more frequently in heterozygous form in "carriers" for the mutant allele. Mostly all gene loci are polymorphic with multiple variations of alleles in which the genetic variations mostly produce the obvious phenotypic traits.